One of NASA's 747 Shuttle Carrier Aircraft touches down at the Kennedy Space Center in Florida on Sept. 21, 2009 after bringing space shuttle Discovery back to its East Coast home. The ferry flight began at Edwards Air Force Base in California a day earlier. Discovery landed in California on Sept. 11 to end the STS-128 mission. The spaceshuttle Discovery returned to its home port in Florida Monday to end a two-daytrek across the country. 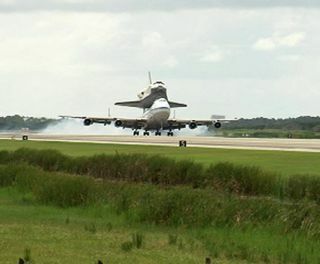 Ridingpiggyback atop a modified 747 jumbo jet, Discovery touched down at NASA?sKennedy Space Center in Florida at 12:05 p.m. EDT (1605 GMT) to be prepared foranother launch into orbit next year. The shuttle was ferried home Edwards AirForce Base in California, where it landed Sept. 11 after a two-week mission tothe International Space Station. The2,500-mile (4,023-km) ferry flight beganearly Sunday in California and stopped in Amarillo and Ft. Worth, Texas torefuel Discovery?s Shuttle Carrier Aircraft before spending the night at BarksdaleAir Force Base in Shreveport, La. Rainy weather over Florida threatened to forceNASA to divert Discovery to MacDill Air Force Base in Tampa Bay, Fla., buteased in time for the shuttle?s noon arrival. Because ofthe bad weather nearby, Discovery?s Shuttle Carrier Aircraft pilots were unableto perform a planned flyover of the region surrounding the Kennedy Space Center- also known as the Space Coast - to give residents more views of thespacecraft riding atop its carrier plane. Discoveryblasted off late Aug. 28 with a crew of seven astronauts to deliver about 8tons of cargo, science equipment and other gear to the International SpaceStation. Three spacewalks were performed during the flight, which lasted 14 daysand flew 5.7 million miles (9.2 million km). NASA wasunable to landDiscovery at the Kennedy Space Center?s Shuttle Landing Facility on Sept.11 due to bad weather. The shuttle was diverted to the backup runway inCalifornia. The ferry flights back to Florida typically cost about $1.8million. Discoverywill be detached from its 747 carrier aircraft using a special crane-like tool, calledthe Mate/De-Mate Device, at the Shuttle Landing Facility and then towed back toits service hangar. The shuttle?s next trip to the space station is currentlyscheduled for March 2010. NASA plansto launch six more shuttle missions before retiring its three-orbiter fleet inthe next year or two. The shuttle Atlantis is next to fly, and is due to launchNov. 12 on a supply mission to the station.